A mermaid archer that hides in a protective shell, waiting for the right moment to strike..
FLIP: After this card is flipped, offer it as a Tribute during your Standby Phase to destroy all monsters on your side of the Field and inflict Direct Damage equal to half of the total ATK of the dest..
FLIP: Destroys 1 Magic Card on the field. If this card's target is face-down, flip it face-up. If the card is a Magic Card, it is destroyed. If not, it is returned to its face-down position. The flipp.. 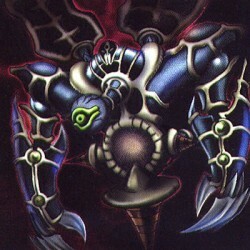 This card cannot be summoned unless "Toon World" is on the field. This card cannot attack in the same turn that it is summoned. Pay 500 life points each time this monster attacks. When "Toon World" is..